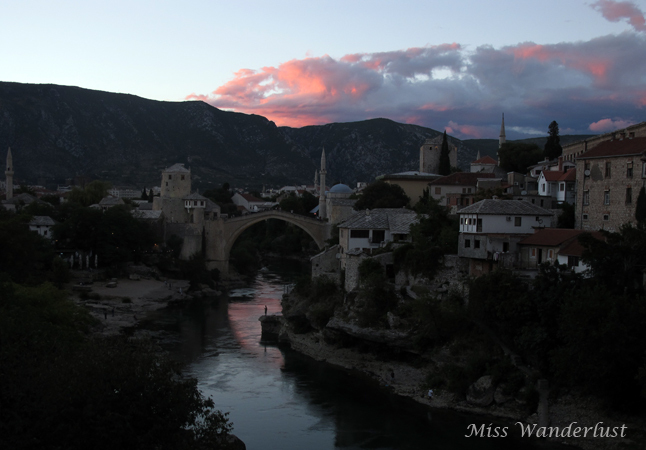 I sat on the balcony of our guesthouse on our second night in Mostar, Bosnia and Herzegovina, reflecting on the last day and a half. The call to prayer was ringing out from I don’t know how many mosques simultaneously, echoing around me, in beautifully haunting voices that could lull me to sleep. And then, as the clock struck 9pm, church bells rang. I was writing in my journal, trying to get all of my thoughts out before I lost them, but my brain was moving too fast for my pen. When Dave and I first began planning this Europe trip, Bosnia wasn’t even on our minds, but visiting there was one of the best decisions we made. We arrived the previous day by car from Croatia. As we went through the Croatian border crossing, our first time actually going through a manned border in Europe, the guard didn’t even open our passports once he saw that they were Canadian. We rolled through the tiny strip of no man’s land and went through the Bosnian border crossing. The guard was much sweeter than you would expect a border guard to be, and gave us a faint stamp in our books only after we asked. There was a bit of an archway of trees immediately after the booth, and once we passed them, we were in Bosnia. It almost seemed different as soon as we crossed the border. Signs are in Cyrillic as well as the Roman alphabet. Most of the cars were much older than in Croatia, Italy, or anywhere else I’ve been in Western Europe. There wasn’t much along the roadways at all – no fast food joints, no strip malls, not even any billboards. After we were driving for about 30 minutes, stands started to pop up along each side of the road, with locals selling gorgeous looking fruits and vegetables at each one. 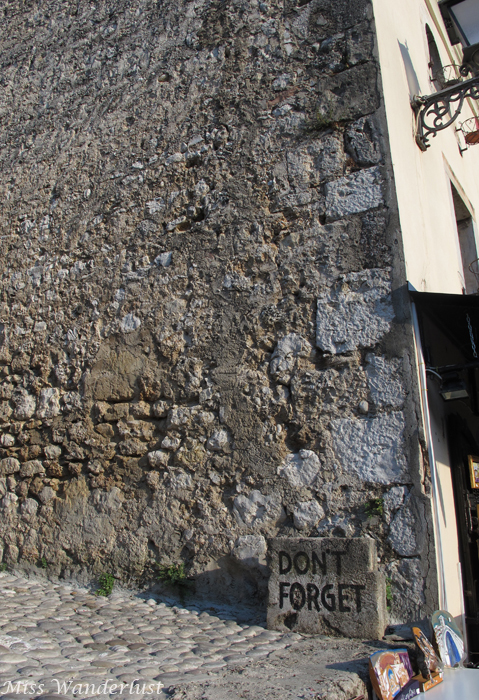 Once we arrived in Mostar, we found our place, Pension Cardak. We met Suzana, one of the owners, and immediately warmed to her. 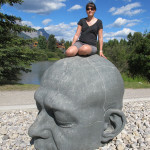 was so warm and kind, on top of being friendly and extremely accommodating. She always had a smile on her face. While she was showing us around, her husband Nedžad drove our car down the tight hill that we had parked on, moved his own car, and parked our rental in his personal garage. Even though we were very hungry after driving for several hours, the only thing we both wanted to do was see the bridge. Stari Most, the Old Bridge, is not only a striking bridge in a stunning setting; it has become a symbol of peace, strength and hope. Originally built in 1566, the iconic Ottoman bridge stood strong for 427 years, until it was heartbreakingly shelled and destroyed on November 9, 1993 during the Bosnian War. Reconstruction work eventually started in 2001, using the same methods and materials as the original, and was finally re-opened in 2004. The bridge is one of only two UNESCO World Heritage Sites in Bosnia. Although I was only 10 years old when the Bosnian War ended, it has always had a presence in my mind. I remember hearing about it when I was a kid and knowing how horrific it was. But I didn’t realize that Mostar was at the crossroads of the war, with seemingly endless fighting and destruction during that time. Once I was actually standing there, gazing at this symbolic bridge, my mind started racing, and I almost felt like I was having an out of body experience. Thinking about all of the ugly things that had happened to the people in this beautiful town and this beautiful country. Thinking that every single person I would walk by was affected in such profound ways by this war, and yet here they still are, going about their lives. Everybody lost somebody, or many somebodies, and yet, time moves on. Life goes on, no matter what happens or how we are feeling. There’s a bookstore on the east side of the bridge dedicated to the history of the bridge and the Bosnian War, which also has many books about other political and historical events. The real draw, though, is the heartbreaking film playing on a continuous loop showing footage of the bridge in happier times, then being shelled throughout the war and eventually collapsing into the Neretva River, and finally being rebuilt and reopening to jubilant crowds. There was one particular shot of a shell hitting the bridge and shattering so much of it that it literally made me jump into the air. By the end of the short video, both my husband and I had tears in our eyes. We later found out that Nedžad shot all of the footage. Later on we visited the small New Muslim Cemetery that had been a park before the war. It is now filled with identical white tombstones with names in Arabic written in gold, with every date of death falling between 1993-1995, and with rarely a person older than their 20s. We didn’t linger for long as I almost felt guilty being there. The following morning we ate breakfast that we had picked up at a small corner store and a bakery down the street from our pension. We had bought two pastries, nectarines, peaches, and yogurt, plus two 500ml cans of beer and two 1L bottles of wine came to a grand total of 15KM, or $10CAN. It was sticker shock in the best way. As we walked to the Koski Mehmed-Pasha Mosque, one of the few that is open to visitors, I had a hard time keeping myself upright. The cobblestone streets are so heavily polished by thousands of footfalls that even on a perfect summer day, they are extremely slippery. We toured the small mosque in no time, and climbed up about 100 steps to the top of the minaret to take in another glorious view of the town, the bridge, and the surrounding countryside. Afterwards we sat in the courtyard to decide what to do with the rest of our day. It was 11am. “Do you want to go to Sarajevo?” I quietly said to Dave. 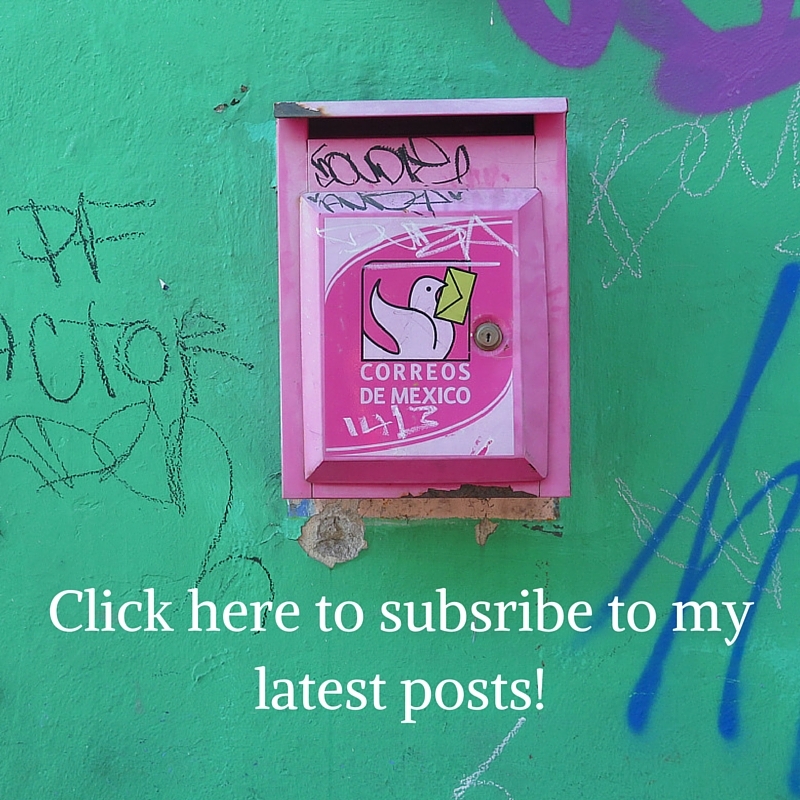 We had briefly mentioned going to Sarajevo if we had time, but the drive would be two hours each way, and would we be there for long enough to do it justice? Sarajevo. Just hearing the name conjures images of a terrible civil war, but also of an immensely historic city, where cultures and religions have mingled for hundreds of years, where the event that some say triggered World War One took place, where the winter Olympics were held as recently as 1984, and images of a beautiful city nestled in a valley between mountain ranges. Beautifully written… romantic in a sad sort of way. My favourite post to date. Can’t wait to read part two. Amazing photographs and interesting point about the Canadian passport leeway. I know what you mean about your brain moving too fast for the pen; story of my bloomin’ life. I love your writing, it’s almost haunting. Very moving post. 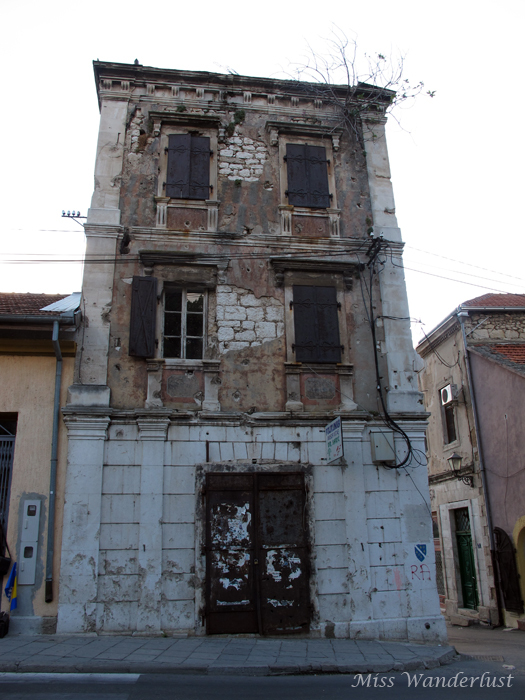 We were just in Mostar for a few days in October and had much the same experience. It is amazing being in a place that so recently experienced such horrifying war times. We even found shell casings in places we hiked or abandoned buildings we ventured into. The bridge is an amazing feat of engineering. Glad to hear you enjoyed it and hope you got to see more of the country. I agree with Dianne, best one to date. Wow, what a great story Karlie. 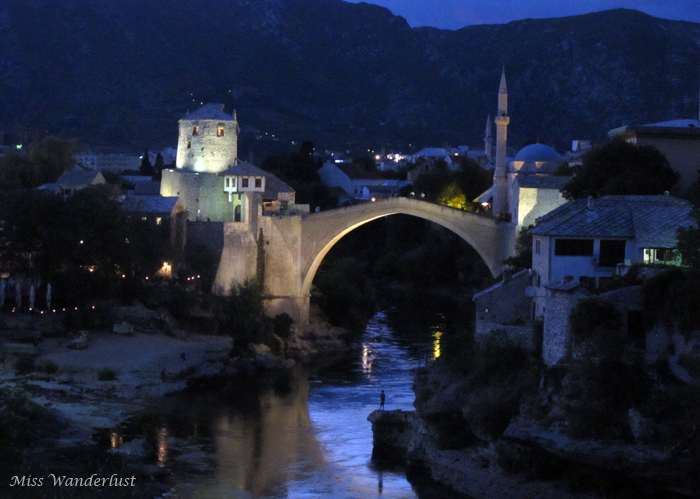 We were there and you definitely captured the feel of Mostar. The war did affect all the people living there and you could definitely see that on their faces. 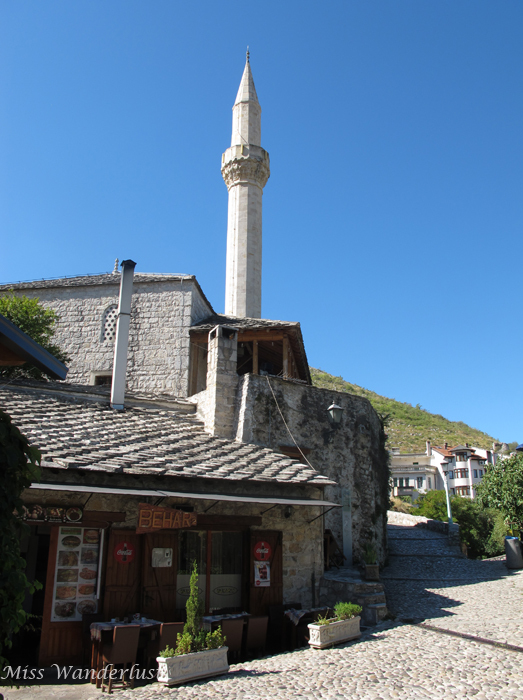 Mostar is amazing city, not just to visit the tourist places for day or so. And you have to bear on mind that Mostar is actually in Herzegovina, south region which country is named for, so your title is a bit missleading. I plan to return to BiH sometime and explore a lot more, so hopefully I will see Banjaluka one day! ear, I would add that people visiting Bosnia should consider hiking. The Bosnia is hiking paradise. And rafting as well. Mountains and landscapes from the tops are breathtaking and lack of pollution secondary to destroyed industry is only positive outcome after the war. You can drink running water from any mountain spring, creek or river without fear of getting something. It is clean and crisp. Some trails are forbidden due to mine fields, so research prior departure is strongly advised. Dear, I would add that people visiting Bosnia should consider hiking. The Bosnia is hiking paradise. And rafting as well. Mountains and landscapes from the tops are breathtaking and lack of pollution secondary to destroyed industry is only positive outcome after the war. You can drink running water from any mountain spring, creek or river without fear of getting something. It is clean and crisp. Some trails are forbidden due to mine fields, so research prior departure is strongly advised.